On Christmas morning 2004, my then-boyfriend got down on one knee and asked me to marry him. I was over the moon with happiness, but I was also hit with a harsh reality -- I had to start planning a wedding! If you&apos;ve set a date for a Spring or Summer 2016 wedding, you&apos;re probably deep in the planning stages right now. Nailing down a venue, catering, a photographer, a cake, flowers...it can all be incredibly overwhelming. Wouldn&apos;t it be great if you could have all of those vendors together in one place? The Happily Ever After Bridal Event brings together local wedding-related businesses in one convenient (and beautiful!) location, The Barn at Kennedy Farm in Lizton. Professionals in every area of wedding services will be on hand to answer your questions and help you plan for the big day. 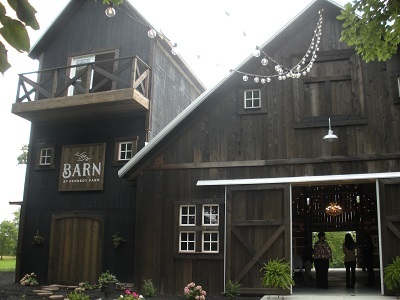 Vendors will include businesses such as Rue de Fleurs, a floral design business who will have display tables set up for every season, and will decorate the barn for this event. Amelia Gray Studio salon will have their mobile wedding unit on site, so brides can see it first hand. Jupiter and Juno will also be at the event, showing off their unique and stylish invitations. These are just a few of the many vendors you can expect to meet. Are you hoping to have live music at your wedding or reception? Be sure to attend the show during the first two hours when popular local musician Natalie Gain will be performing. You might remember her from the popular Grimes Girls musical team. This is a great way to get a preview of her skills! There&apos;s another great reason to come out for this special event -- giveaways! Attendees have the opportunity to win several great prizes, including a $500 VISA gift card. And who wouldn&apos;t love another $500 to spend on their wedding? There&apos;s also a chance to win $1,000 toward a wedding at West Chase Golf Club, Catered by Dawson&apos;s Too. When: Noon-4 p.m., Sept. 27. Where: The Barn at Kennedy Farm, 525 N. State St., Lizton. Admission: FREE! But attendees are asked to pre-register. Find even more info and a full list of vendors here.